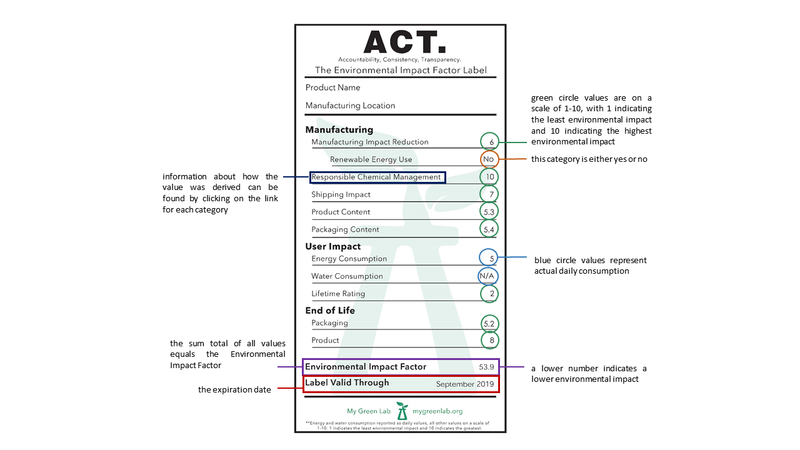 The ACT label is a way for scientists, sustainability directors, procurement specialists, and manufacturers to speak a common language. Until now, identifying third-party verified safe, sustainable products was a near impossibility. ACT provides a level of transparency that reflects the highest standards in sustainable procurement. Manufacturing practices and supply chain management can have a significant influence on a product's environmental impact. ACT includes audits of the impact of manufacturing, an understanding of chemical management within the product and throughout the manufacturing process, the impact of shipping products, and an analysis of the raw materials and the sustainable material content of the product and its packaging. Life science equipment often consumes energy and/or water when being used in the lab. ACT captures this usage information and displays it clearly, making it easy to make choices about equipment based on energy- and water-efficiency. All laboratory products have a recommended shelf life. ACT evaluates the longevity of life science products as it relates to sustainability. The end of life of laboratory products does not have to be the landfill. This aspect of ACT captures opportunities for recycling, composting, and take-back programs for both the product and its packaging. The ACT label references many industry terms. The terms associated with the label have been defined to ensure that all users understand the implications of the results.